Hello. My name is Biscuit. I've visited Killer Characters a couple of times before, and usually come here when my wonderful human Carrie Kennersly asks me to. I still don't understand too much about it, but Carrie tells me she's the human whose stories are being told in the Barkery & Biscuits Mysteries. Those stories? They all have something to do with murders of human beings, and Carrie gets involved with figuring out what nasty person actually did it. I think I mentioned last time that a book called PICK AND CHEWS would be coming out describing the fourth of Carrie's adventures. It's out now. I also mentioned that Carrie owns two shops, one a bakery for humans and the other a barkery where she bakes the most wonderful treat for dogs, ones she created in her other job as what she calls a vet tech. Mostly, she explains to me that she works there part time to help save dogs' lives, and I'm all for that. I'm also all for her baking those treats, and letting me sample them. And yes, I mentioned that Carrie's closest friend these days seems to be Dr. Reed Storme, a veterinarian at her vet clinic where she works. I like him, and I even like his dog Hugo, who's bigger than me. I'd also said that Reed sometimes tells Carrie to stop investigating those people murders which was fine with me, since he says it's dangerous and she could get hurt, which would be terrible. Only, from what I understand about PICK AND CHEWS, Reed is considered a murder suspect so this time he doesn't tell her to back off, at least not completely. So I'm still worried. But my Carrie is smart, so she'll come out of this one okay, too--I hope. 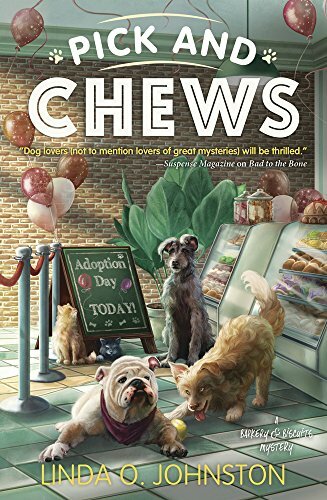 Anyway, she tells me PICK AND CHEWS is now available, and so are her other stories: BITE THE BISCUIT, TO CATCH A TREAT, and BAD TO THE BONE. I'm in all of them, of course, although they don't always show everything I've done to protect my human. I'd do anything for her. Carrie's in those stories, too, and so are lots of other dogs besides me, plus some of Carrie's friends, like Reed. As long as my Carrie stays safe and provides me with more dog treats, I'll be happy. I think it is very good of you to worry about Carrie. Sometimes we humans just jump into situations without thinking, but we do like helping others. I am glad you watch out for her. I miss having a good dog watching out for me. Love that this series is about you Biscuit. Well, maybe a little bit about Carrie but I sure love reading your commentary about all the wonderful adventures. Just keep on keeping Carrie safe and tasting those treats (quality control ya know ;) ).